Some cars are functional and serve a specific purpose, some cars are groundbreaking in one way or another, and others are just plain fun to drive. For my most recent vehicle test, I had a vehicle that falls squarely in the the final category; specifically, the Scion FR-S — a sporty little rear-wheel drive ride that has a sharp look, a powerful get-up-and-go, and will definitely turn some heads. Upon first seeing the Scion FR-S, the first word that popped into my head was racecar. It’s built low to the ground, and has a very sharp and sporty design. 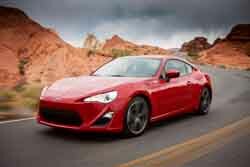 Craig Taguchi, public relations specialist for Scion (which, FYI, is a division of Toyota with vehicles typically aimed at a younger crowd), said the FR-S opens the Scion brand up to a “new world of high-performance driving”. The design of the vehicle is definitely more youth-oriented, with its black cloth seats highlighted by red accents. It’s a two-door vehicle, and realistically has seating for two people. If you’re extra short, it’s possible someone could squeeze in the back seat behind you, but that’s really going to just be a storage area for 90 percent of people. In theory you could fit a child seat in the back, but this doesn’t strike me as the type of vehicle you’ll be dragging your baby around in. The in-car screens and visuals, and even the shifter, have a very racecar-esque look to them. You get 17-inch wheels standard, but a new version of the FR-S coming out later this year will offer an option for 18-inch wheels. Side note: It’s no shocker that this vehicle looks like a racecar; it actually is one. A version of the FR-S will be used by competitors this spring in the 2013 Toyota Pro/Celebrity Race in Long Beach this April. One thing that makes things pretty simple if you’re buying a Scion is that the specs are basically standard across the board. All you really need to do, whether buying an FR-S or another Scion vehicle, is choose the color and the transmission. The rest is all going to be the same. Power doors and windows are standard, and you get electric power steering, among other features. During my time with the FR-S, fuel mileage was extremely consistent at 28 mpg combined city/highway, not too bad for a sports car like this. The official numbers listed are 25 city/34 highway/28 combined for the automatic transmission, and a couple mpg less on the manual transmission due to adjustments in gear ratios to make them more aggressive. If there’s one thing everyone can agree on about the Scion FR-S, it’s that this thing has some serious get-up-and-go. If you’re at a stop, and need to get going fast, you’re going to have no problem whatsoever here. Just hit that gas, and you’re gone in a flash. No slow buildup here, as 0-to-60 has been tested at about 6 seconds. Not bad for car that starts about $25K. Taguchi said the combination of a strong motor and the design of the vehicle make it so easy to get going so fast. Between this quick start ability, and the fact that this vehicle will instantly go where you want it, when you want it, it’s clear that the 200 horsepower engine makes driving a very enjoyable experience in the Scion FR-S. In addition to the powerful motor and acceleration, the maneuverability of the FR-S if you need to shift lanes is very responsive — again, this fits right in with its racecar tendencies. I had a very enjoyable week driving the FR-S around, in large part due to this very responsive nature. It’s safe to say that the elderly or anyone looking for a family vehicle won’t be in the market for a vehicle like the Scion FR-S. So who will be? Obviously, there’s a younger target here. If you are a young guy out trying to impress the ladies, this is probably the most affordable option out there for you. Or you might be an older guy looking for a weekend vehicle to enjoy and get a little racy on the road. There are some settings that can be adjusted on the Scion FR-S. For one thing, you can turn the traction control on and off. It’s something you’re going to want to keep on in order to maintain traction while driving on regular streets. But if you’re planning to go off the highway or to a racing event on a track, many drivers will choose to shut off traction control to avoid having the computer control it. One thing I learned on the day I got this vehicle is that it didn’t drive well in a snowstorm — it was a little bit tricky winding through unplowed subdivisions with this vehicle. Luckily, there’s a setting on here (called Snow, appropriately), and when the button is pushed, it softens the onset of power, so you won’t spin the tires as much when trying to get through this pesky snow. Still, it’s much better to drive this thing when the weather is clear. The Scion FR-S I tested lacked some of the more advanced in-car tech that you get with many new Toyotas, as the design was a bit more stripped down. — A standard USB slot, for connecting a music device like an MP3 player to the vehicle, or for charging a device. The FR-S does not include an SD card slot. The music I heard was coming from an 8-speaker, 300-watt sound system that sounded great (160 watts from head unit, and 140 watts from external amplifier). After all, if you’re driving a sporty car, you want to be able to blast your music properly. And while I did not have this on my test vehicle, you can upgrade to a premium audio unit, called BeSpoke premium audio: That unit offers more watts (340) and a 5.8 inch touchscreen. (my vehicle no touchscreen at all, just regular dials). The BeSpoke audio system features Pandora access on screen; but in a different interface than you get with Toyota’s Entune setup. BeSpoke also features access to features like Twitter and Yelp. Even if you get the BeSpoke system, there is no rear camera offered to help you when you are backing up. There is also no OnStar-like emergency system to automatically notify 911 in case of an accident. And you won’t get some other safety features like blind spot warnings here, either. While the Scion FR-S does note offer traditional navigation with maps on-screen, they do offer something called “routing”. It’s similar, but it works through your phone and is cloud-based. You are told in advance by voice and on screen what the turns will be, but maps aren’t preloaded like on other vehicles. To paraphrase AC/DC, this is a fast machine and it’s motor is clean. You get a 200 horsepower, 2.0 liter, 4-cylinder boxer engine with dual variable valve timing. Another feature is the D-4S injection system, that was adopted from Toyota’s Lexus line. In layman’s terms, instead of one injector per cylinder; there are two. One is for the regular port injection and the other is a direct injector, so the computer can tell them how to fire to make the vehicle high performance, but still get good gas mileage. This helps make the vehicle run more efficiently. The vehicle features 151 pound-feet of torque, and you choose between a 6-speed manual transmission and a 6-speed automatic transmission. Paddle shifters are included on the automatic vehicles to allow you to have a more sporty drive. “A lot of times in automatic cars with paddle shifters, shifts are slow and not crisp and don’t rev match, but this one does,” Taguchi said. The only thing you can control by voice in the FR-S is to make phone calls via your Bluetooth connection. The rest (radio, climate, etc.) are all accessible by the dials in the center console. There is a cruise control knob setup underneath the steering wheel, but other than that it’s kept empty. This is the only Scion without audio controls on the steering wheel — and Taguchi said this was done because it’s a sports car and they wanted to keep things more simple. The Scion FR-S I tested came in at $26,099. If you want to start adding a la carte features (which Scion does offer for people who want to boost performance), you can push that higher. Among the features you can add are a spoiler, an exhaust system, wheels or suspension upgrades and more. These features are not bundled together, so you only choose what you want. A vehicle like this is pretty specific in terms of who its target audience is. But regardless of whether you fit the target groups, if you’re looking a very sporty vehicle that offers a very fun drive and a somewhat low-frills tech approach, and most importantly an affordable price, the Scion FR-S could be right up your alley and is definitely worth a test drive. Business road warriors have specific needs when it comes to their work machine. It has to be smaller and portable, but still powerful, as well as impressive in the security department. HP’s EliteBook line caters to this crowd, and their latest offering in this line — the HP EliteBook 2170p — aims to please in all these areas. I recently spent some time with the machine, and am back with a full report on how it measures up. My first glance at the machine left with a pretty clear thought — This is small. Depending on what you prefer from a laptop, that may be a good thing or a bad thing. If you are the road warrior type, you’ll probably want something of this size (it features an 11.6-inch screen) for ease of travel. But others may find it too small, and prefer to opt for a machine in the 13-inch range so they can see things a little bigger. It’s really all in the eye of the beholder, and there are other options out there is you want to step it up an inch or two. The weight on the unit is negligible, just under 3 pounds (2.89 exactly), and that was in part achieved by the use of magnesium casing, which creates less weight. Despite the lightweight nature of this machine, it’s still very durable, as all EliteBook machines are put through rigorous testing (drop tests, lid pressure tests, and tests for heat, cold, humidity, altitude, resistance, shock testing and more). The machine features a spill-resistant keyboard that has a bottom case drain, so if you spill some liquid onto the keyboard, it goes through the drain hole and limits damage. The machine’s full specs are 11.5 inches wide, 7.56 inches deep and 1.04 inches thick. While it is very light, the 2170p is not officially an ultrabook according to Intel’s definition — It’s quick a bit thicker than the ultrathin laptops that have come out lately. The EliteBook 2170p comes with a couple of battery options, a 4-cell battery or a 6-cell battery. My machine had the 6-cell battery, which was so-so in terms of average lifespan per charge. I could use the machine about five hours before running out of juice, not terrible but less than some other machines I have seen. The good thing is that the battery is replaceable, so if you want to carry a spare on you it can be popped right in. Battery life does increase if you choose a solid-state hard drive, but that will cost you a significant premium. While this is a smaller machine, you still get a full-size keyboard, but you lose the bonus number pad on the right that larger machines often offer. The touchpad is a little smaller than you’ll see on larger machines, as logic would dictate, but it’s still quite responsive and easy to use. I had occasional instances of accidental touchpad brushing moving the cursor, but it wasn’t an epidemic. One minor issue is there are too many buttons placed around the touchpad — it just looks cramped. There’s a point stick in the middle of the keyboard that can be used to maneuver around the screen, but that’s a feature I’ve never really liked using. You get an option to get a backlit keyboard, something that is essential if you are going to be working late nights or in dark areas. It would also help if you were on an airplane working, as business travelers often are. The EliteBook 2170p’s 11.6-inch display features a 1366x768 resolution high-definition panel, which looks decent but unspectacular in terms of sharpness. There is no upgrade offered, and I would have liked to see something closer to a full-HD screen available. Getting to the guts of things, what powers this machine is what’s really important. For processor, you get the latest Intel processors — in versions from i3 to i5 to i7. If you go with an i5 or i7 processor, you will have VPro support offered . My version that I tested had an i5 processor, which with rare exception was able to handle the heavy multitasking I threw at it. There are two memory slots, so a variety of RAM options are there: My machine had only 4 GB of RAM, but you can go all the way up to 16 GB if you are a power user who is really going to put this machine to the test. There are many hard drive options available. If you’re willing to pay a little extra, you can opt for a solid-state drive (which features no moving parts), in sizes of 128, 180 or 256 GB. These SSD options also feature a quicker resume and boot capability. If you opt for a traditional hard drive, you can choose from either 320GB or 500 GB; and there is also a self-encrypting 500 GB hard drive offered to further improve security. You have some options here, but HP expects the majority of people to stick with the Windows 7 OS for now. The machine also features the option to choose Windows 8 and Windows 8 Pro, should you desire. Both operating systems have their high points, and Windows 8 can be a bit quirky at first, so it’s really up to you and what system you’re comfortable using. For a smaller machine, the sound on the EliteBook 2170p is decent, just don’t expect much quality on the bass end. You can opt to include a 720p webcam — which is a good idea to help you while on the road to keep in touch face-to-face with work and your family. There is No HDMI port, a feature HP aims more toward its consumer products and not the business lines. It does, however, have the following ports: 1 DisplayPort, 1 VGA port, 1 USB 3.0 port, 1 USB 3.0 charging port, 1 RJ-45 (Ethernet) port, a combo stereo headphone/microphone port, and a docking connector. There is also a 5-in-1 expansion slot for SD/MMC input. You get a lot of security features with the EliteBook lineup, as that’s a key concern of business users. Among them is a fingerprint reader to block access by unauthorized users. VPro support from Intel (offered on the i5 and i7 processors here) allows for advance management of the machine, including remote monitoring and maintenance from IT folks back at the office while you are on the road. HP Disk Sanitizer comes into play if you’re passing on a computer to someone else . It writes bogus data across a hard drive so it’s “thoroughly scrubbed” and data can’t be retrieved even if someone is digging around and trying to recover that wiped info. You can also subscribe to Computrace and that will always find your computer if it gets lost. Even if the machine has been reimaged with new hard drive, it can still phone home and be found via Computrace. There are lots of HP programs offered here which you may or may not use: HP Power Assistant; HP Recovery Manager; HP Support Assistant, for example. Microsoft Office Starter is offered on Windows 7 models; but on Windows 8 machines, you get a 60-day trial, then you have ability to purchase the full version of Office (or use a previous key code). If you don’t wish you go the route of purchasing office, you can still use programs like WordPad to do your word processing. The HP EliteBook I tested came in at $1,099, which isn’t too outrageous considering that it was pretty powerful, durable and offered key business-focused features. Still, with so many ultrabooks coming out that are thinner and less expensive, it’s probably a little bit on the steep end. The price of the machine will vary, of course, depending what kind of features you add to it, of course. This is a machine that knows who its target audience is, and goes straight for them. It’s not meant to be a home computer; most of us want something larger for our everyday home use and media viewing, so this just wouldn’t work in that regard. But when you’re on the road and need to take care of business, and want a powerful, light and secure machine — there are fewer options available to you. That’s the market space where this machine will be an option, and it’s not a bad option at all — as long as you’re prepared to settle for the 11.6-inch screen, which will be too small for some folks’ tastes, and aren’t expecting stellar display quality. 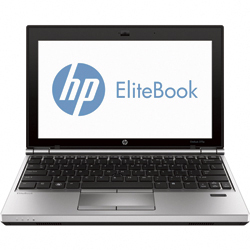 For more information on the HP EliteBook 2170p, visit www.hp.com. Follow Matt Myftiu on Twitter @MattMyftiu. Verizon Wireless is continuing to expand its 4G LTE network, introducing coverage in four new markets across the country (today) Feb. 21, including in Alpena. Other markets also launched today include Kirksville, Mo., Poplar Bluff, Mo. And Abilene, Texas. Verizon Wireless will be further expanding its footprint in the Northeast part of Michigan later this year. The Verizon Wireless 4G LTE network reaches 273.5 million people across the country – close to 89 percent of the U.S. population – and is now available in 480 markets. For additional details on the Verizon Wireless 4G LTE network and its coverage, please visit http://verizonwireless.com/lte. T-Mobile has announced that it will soon offer its customers the new HTC One, a 4G LTE smartphone that will introduces features including HTC BlinkFeed, HTC Zoe and HTC BoomSound, HTC Sense innovations that help reinvent the mobile experience. The new HTC One is T-Mobile’s first Android smartphone featuring the new HTC Sense experience with HTC BlinkFeed at its center. HTC BlinkFeed transforms the home screen into a single live stream of personally relevant information such as social updates, news and photos giving people fresh content at a glance without the need to switch between applications. Wrapped in a zero-gap aluminum unibody, the brilliant 4.7-inch full 1080p HD screen displays the new breakthrough camera experience of HTC's UltraPixel Camera with Zoe, which gives people the ability to shoot high-res photos that come to life in three-second snippets.